Sterling Investments Limited (SIL) for the three months ended March 31, 2018, reported a 4% decline in total revenue to $31.44 million compared to $32.59 million recorded for the corresponding period in 2017. Interest income closed the period at $20.97 million, up 15% from the $18.16 million for the comparable period in 2017. Unrealised loss on quoted equities for the period amounted to $333,844. The company experienced a 40% decline in total expenses for the period to total $6.34 million (2017: $10.53 million) for the year ended March 31, 2018. This resulted from decreases in two expenses categories. Interest expense totaled $2.15 million (2017: $1.14 million). Other expenses totaled $6.39 million, an increase of 1% (2017: $6.30 million). SIL booked an impairment loss on available for sale securities of $2.19 million relative to the gain of $2.69 million for the corresponding period in 2017. The Company booked no unrealised gain on derivative relative to the gain of $392,078 for the corresponding period in 2017. Operating profit recorded for the period closed at $25.09 million relative to $22.06 million booked for the prior year, a 14% increase year over year. Other income for the period grossly increased from $463 to $21,672, a 4581% or $21,209 increase. No preference dividend expense for the period was recorded relative to the $3.50 million recorded in 2017. Tax charges of $272,753 (2017: $192,886) was booked for the period and as such, net profit amounted to $24.84 million (2017: $18.37 million), a 35% or $6.47 million increase. Total comprehensive income for the year amounted to $47.81 million compared to $16.16 million booked for 2017. Earnings per share for the period amounted to $0.42 relative to $0.31 in 2017. The trailing twelve months earnings per share amounted to $0.99. The total number of shares used in the calculations amounted to 59,370,882 units. 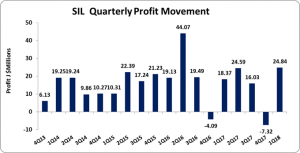 Additionally, SIL’s stock price closed at J$12.80 as at the end of trading on May 15, 2018. Shareholder’s equity as at March 31, 2018, stood at $853.30 million compared to $824.53 million in 2017. The book value per share amounted to $14.37 (2017: $13.89).